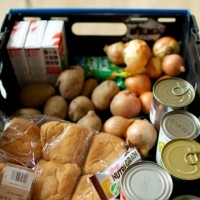 The Father's House Food Bank is open on the 1st and 3rd Fridays of each month from 4:30pm - 6:30pm. Seniors and handicapped clients are welcomed to the front of the line if they show up before 4:15pm. For more information, click here.